Separate and Equal at 59E59 Theaters delivers poetry in motion. Set in Birmingham, in May of 1951 the play encapsulates the contradictions and tensions of the pre Brown v Board of Education south as it reflects in the lives of six teenage boys, three white and three black. The play unfolds as a series of plays on the basket ball court beautifully danced and remarkably faithful to the moves the sport. There is at times the grim vitality of a war dance, as well as the sheer energy of adolescent masculinity in its ever present demand for self realization. Laurence M. Jackson's choreography allows us to believe both. The rundown basketball court is off limits to blacks except on Sundays. We face the empty court. Projected images, created by Maya Champion, of two water fountains one White and clean the other Colored and in poor repair hover above the periphery, informing the scene. The basket hoops appear as projections-- as does the scoring ball. 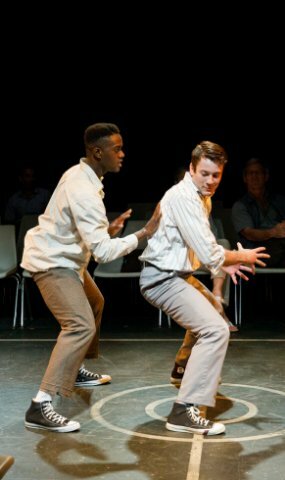 We begin in a metaphoric reality with two boys-- Calvin Richardson (Adrian Baidoo) and Edgar Roberts (Ross Birdsong) facing each other bouncing the unseen ball to an increasingly aggressive rhythm. The ball in play is invisible, it is an echo, a sound which bounces on the court, and is tossed from hand to hand. It is caught with a loud clap, dribbled with staccato speed, and fills our ears with the expectation of victory. .Composer, Tom Wolfe, plays with time in the percussive use of the ball a score which fills the scene without invading it. The black young men are there to perhaps sneak in a basket or two at the risk of being caught and arrested for vagrancy-- or worse. The white teens are playing hooky and are eager to play ball before they are caught and hauled to the principal's office for a paddling, or worse. The worst threatens periodically in the form of an abusive policeman “Kid Gloves” (Ted Barton) who comes round to check on things, uphold the law and terrify the boys who know they are breaking the rules. He is the personification of the segregationist system, and the rule of white supremacy. He is there to enforce ordinance 597, enacted 5/20/1951, the most recent segregationist law which specifically prohibits whites and blacks playing ball together. His younger partner Lieutenant Dixx (Jeremy Cox) tries a more reasoned approach as he struggles to maintain rules he himself seems to question. As an almost mirror image of the values embodied by "Kid Gloves", a local Black old man, Two Snakes (Will Badgett), shuffles and shines to protect the boys from the abuse by the the police. In this grim travesty of human dignity, the rules which maintain the color line are understood. Playwright Panitch has skillfully written the subtext of class, race, gender and power relations that underpin the Jim Crow south. The social back stories of the boys on the court are woven in as flash-backs, recollections and articulated snippets. The stark violence of a lynching is captured as Everett George (James Halloway) tells the story of his brother's ill fated return from the Korean War. The day-to-day humiliation of blacks is well expressed in the admonition of Calvin's mother, Viola Richardson (Pamela Afesi), to address all whites as mister. This includes even Edgar who he has known from earliest childhood, and in fact is his half brother. Both women have been deeply humiliated by the misconduct of the departed Mr. Roberts. On the ball court, the dialog is a fast-paced combination of vulgarity and naivete. The actors are wonderful in conveying adolescent angst. Awkwardly, angrily, and not without fear the boys lurch towards using the court together. They have become partners in crime, breaking the rules. How can the game be played if one side is always right, if no foul can be called against a white player, if the push and shove of the game means the physical contact of black against white? The shortest player, Jeff Forrest (Steven Bono Jr.), and the tallest boy, Nathan Parker (Edwin Brown III), are both the best players and deadly rivals. They also share the fact that they both work at the local factory under a violent, oppressive boss. Are these mavericks children who refuse to allow the adult demands to stop them from their game, or are they young adults who are standing up for change? Are they small unsung heroes who we are asked to recognize and to help? Doing what is right is “gonna to cost you something," Mr. Finch (Ted Barton), a drunkard lawyer, warns his son. In his law practice, the father represents blacks accused of local crime. Wesley Finch (Dylan Guy Davis), the fat white boy who absorbs the insults of both black and white acts, acts as a catalyst that moves the drama forward. He reminds us all that the process is not an easy one and neither the external repercussions nor the internal pain leave us without cost. The cast is vibrant, the writing is crisp and the direction flawless. The subject matter remains meaningful in today's context on and off the ball field-- as NFL players kneel in protest.